Utagawa Kunisada/Toyokuni III (1786-1865) Portraits From Hit Plays of Both Historical Stories and Modern Life (Jidai sewa sugatami): Yaoya Hanbei, 1858. Oban. This terrific print, a companion piece to the portrait of Otomi, depicts Nakamura Utaemon in the role of Hanbei. The play Sewa Ryôri Yaoya Kondate is based on the true story of a double suicide in Osaka in 1772. Hanbei, an honourable man, is seduced by his step-mother; however he is devoted to his wife and, feeling compromised, he decides to take his own life. Unable to live without him, his wife joins him and they commit shinju (a lovers' double suicide) rather than live with the dishonour. Kunisada depicts Hanbei leaving the home of his step-mother en-route for his fatal meeting with O-chiyo, his wife. Dramas about lovers’ suicides were hugely popular with Edo audiences; social pressures on young people at this time were immense and the conflict between duty and passion was common. Such was the extent of the problem that the government was obliged to ban plays based on shinju because of the epidemic of imitation. In this beautifully balanced print, Kunisada depicts Hanbei in a similar pose to that devised by Kuniyoshi in a print of the same subject from 1847 from the series The 100 Ogura Poets Compared. This was a successful edition which combined prints by Kunisada, Kuniyoshi and Hiroshige. Kunisada would have been very aware of the startlingly original design of the Kuniyoshi when designing his own version. 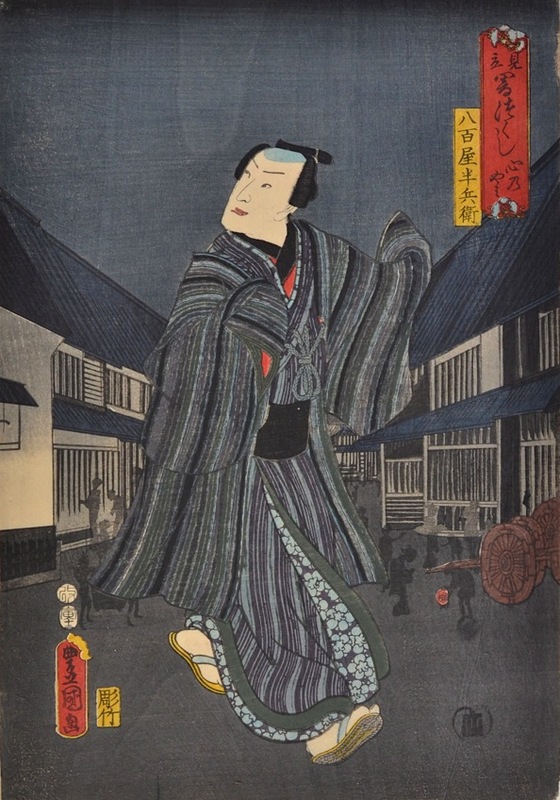 For this design, Kunisada has changed the orientation of the figure (although not the sense of it), and set it at night with the same background perspective of town buildings. Once again, Kunisada’s use of subtle monochrome colour and deft use of overprinting is masterful. There exists a further treatment of the same subject by Kunisada from 1852 which is somewhere between the two poses and with a similar background. Full size, with excellent bokashi throughout. Fine impression and condition, unfaded colours.